I am working on a piece for Kinect and piano and my notion is to use the topography of mountains for control signals and to generate pitch. 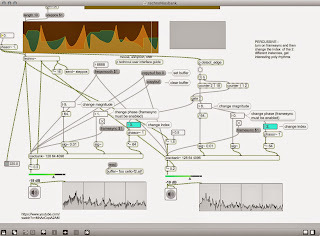 Above is a patch to explore some synthesis of topography with the audio below. Here is an audio sketch of Mount Huntington, in the White Mountains, turning the topography into a melody for piano. It is the beginning of an idea. A shot from our trip to Round Island. A fabulous Clevis composting toilet I am working on a piece that is, for lack of a better term, a one man opera. This is in conjunction with my good friend Nathan Krueger. We are investigating the etiquette of communication in the modern age and considering a case study. That all leads to me having some material of Nathan singing on hand. One of those melodic fragments got stuck in my head, along with the piano part I imagined, so I wrote it out. The text is "Single mothers, injured veterans, the aging unemployable Americans. Is there and app. for them?" I also created a stretched out version of part of this fragment. I think I am going to change the text if I keep this song around. "Single fathers, Ignored veterans, the aging unremarkable Americans. Is there and app. for that?"